Delight in it all! 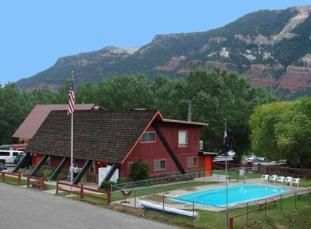 Camping at United Campground is equivalent to having the best of two worlds: “The get-away-from-it-all-camping adventure” and “The explore-historic-downtown-Durango experience.” It is as easy as jumping on Durango’s FREE Trolley, which stops right on the grounds. No tow car; No worries! This vibrant mountain town’s event schedule is chock full of reasons to celebrate: The Arts, Music, Sports, History, Kid stuff, Food and Brew…to name a few! For train enthusiasts, you will be able to get a private showing of the historic steam-powered train as it chugs on by, giving you many opportunities to photograph, feel the power, and imagine times from a by-gone era. This relic, DSNGRR, the Durango Silverton Narrow Gauge Rail Road train is one of only a few of its kind, still running. 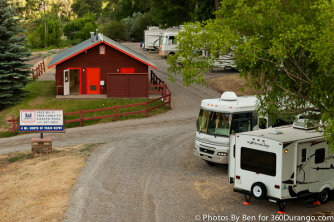 United Campground is a great place to set up quarters during the annual Durango Rail Fest. Happy campers need not go far to take in the sights and sounds of nature while casting or wading in the Animas River, which borders the property. Wildlife seems to like this milieu, too! Whatever your passion may be: from fine dining in town to hot dogs on the grill, all is within your reach. With easy access to nature, and amenities designed to both excite and soothe the soul, everyone in the family will be satisfied. There is even a pool with a view! Enjoy a swim in the heated, outdoor swimming pool surrounded by red cliffs or take advantage of the countless nearby recreational activities, including golfing, hiking, kayaking, rafting, gliding, or biking. It is not hard to tell that United Campground is family-owned because the park’s camp hosts go out of their way to promote a warm and fuzzy feeling to all, tent-ers, and RV-ers alike. Even your dog will feel at home. Forget the hamburger buns? Need a souvenir? Do not fuss! There is a store on site with more than you need. Wi-Fi, Cable TV, arcade & billiards room, and laundry facilities are also available. Please call for reservations and directions.